This month's challenge for Etsy's Fiber Arts Street Team is to create items inspired by the garden and/or flowers. This is our second month as a team for members to participate in a group challenge. It is a great way to get all members involved and promote our wonderful fiber art. Please visit FAST's website for more info about it all, or how to join FAST if you are an Etsy fiber artist. 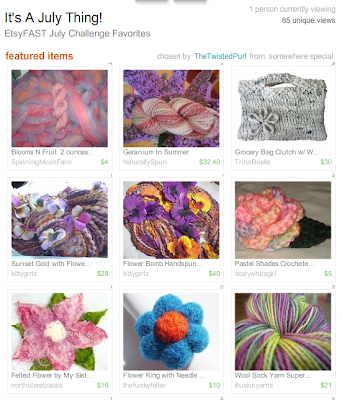 You can also search Etsy for "EtsyFAST" and "JulyChallenge" to find many participants' lovely items, and here's a screen shot of a fabulous July Challenge treasury by The Twisted Purl, a fellow FAST member.